1. Are the hobby paints intended to be used good representations of the original colours shown here? 2. Is "scale effect" to be incorporated? 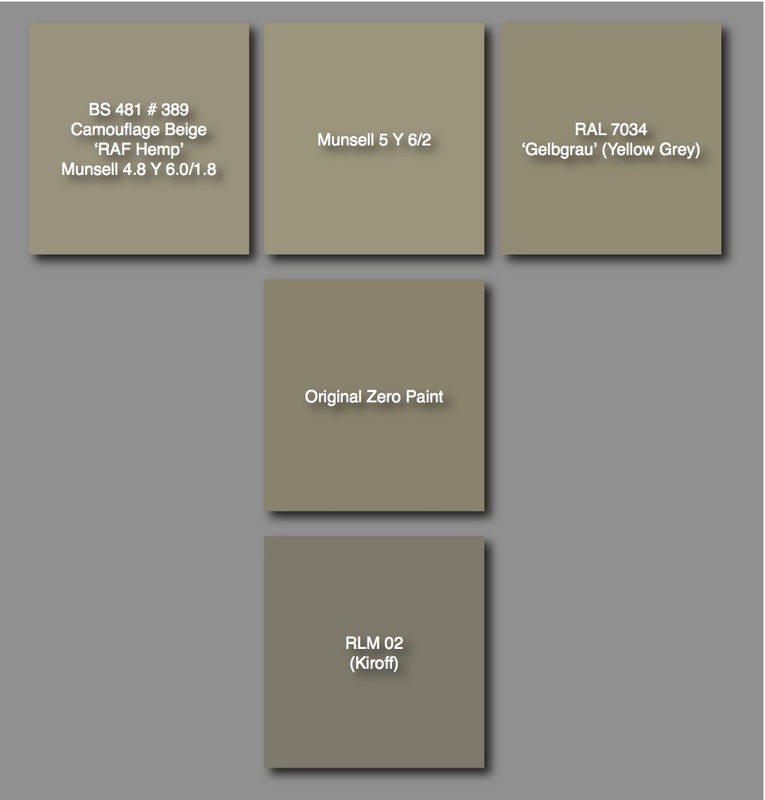 With regard to 1. some versions of "Hemp" hobby paint are quite brown in appearance, whilst as explored here some versions of RLM 02 are a little too grey or too "cool" a grey-green. 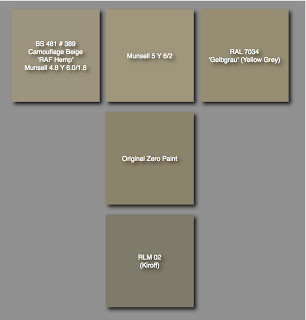 Most of the RLM 02 paints will have to be lightened and can be brought closer to the Zero paint colour in appearance by adding a little yellow ochre (RAF Midstone is suitable). If the RLM 02 paint is a cool grey-green to start with then using an alternative brand is suggested! Consideration of 2. is a matter of personal choice and has been debated at length elsewhere. Tamiya XF-76 is a reasonable representation for a moderately oxidised and chalked aircraft in service but is not exactly similar to the original paint colour being slightly cooler and greyer/greener. If startled by these colours please bear in mind that contemporaneous descriptions of the Zero paint colour were "J3 hai iro (灰色 ash/grey colour) slightly towards ame iro (飴色 amber or yellowish-brown colour)" and "hai nezumi iro" (灰鼠色 grey rat colour).